A teenager has appeared in court accused of breaking into two cars. Stephen Smith, of no fixed abode, is charged with theft from a vehicle, attempted theft from a vehicle, criminal damage and possessing cannabis and diazepam. The offences were allegedly committed between September 2014 and February this year. 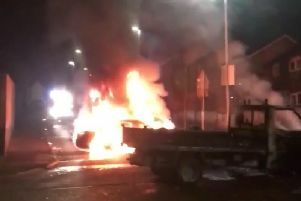 Derry Magistrates Court heard allegations the 18-year-old was connected to the attempted theft and theft from the cars by a fingerprint. A window in one of the cars was allegedly smashed and items worth £650 were stolen from the car. The 18-year-old was arrested earlier this week and was seen putting something into his mouth. This was later found to be five diazepam tablets and a small amount of cannabis, which he admitted were for personal use. Opposing bail an investigating officer said the teen is a ‘priority offender’ and police fear he may not turn up for trial. The officer said police had attempted to arrest Smith last week but he ‘fled’ from them. He added that the proposed bail address is too close to where the alleged incidents took place. District Judge Barney McElholm refused bail for fear of further offences and fear he would not turn up for trial. Smith was remanded in custody to appear in court again via videolink on March 5.